Founded in 1999, SolarWinds (NYSE: SWI) provides powerful and affordable IT management software to more than 93,000 customers worldwide – from Fortune 500 enterprises to small businesses. We believe that the IT pros who use our products everyday should be excited about them. That’s why we put our users first in everything we do, and strive to deliver powerful functionality while making their jobs easier. We call it “user-centric software,” and we believe that it’s changing expectations for the enterprise software experience. Our company was built by network and systems engineers who know what it takes to manage today’s dynamic IT environments. They combined this expertise with a deep connection to the IT community to create network, storage, and application management products that are effective, accessible, and easy to use. The result? IT management software that works for you. SolarWinds is proud to add DameWare Mini Remote Control and DameWare NT Utilities to the SolarWinds family of products! 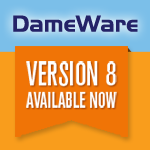 Should you require any assistance with your DameWare tools, you can contact us via email at support@dameware.com . 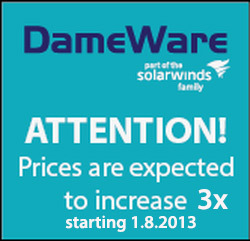 We thank you for your commitment to DameWare and we welcome you into the SolarWinds family. and Mini Remote Control has recently been released? DameWare NT Utilities provides an integrated collection of Microsoft Windows administration utilities within a centralised interface for remote management of Windows servers, workstations, desktops and laptops. DameWare Mini Remote Control comes with features to remotely control servers, Windows machines and troubleshoot user problems. Online chat: your customers can chat with their remote user as they troubleshoot or configure their machine. Screenshot capture: they can click to quickly capture and save a screenshot from the remote machine. DameWare Mini Remote Control comes loaded with features to remotely control servers, Windows® machines, and troubleshoot user problems – including chatting online with your remote user and screenshot capability. Don’t let the name “mini” fool you! DameWare Mini Remote Control (MRC) is loaded with features to remotely control servers, Windows machines, and troubleshoot user problems. MRC delivers one of the most comprehensive feature sets in the industry, with a licensing scheme and price point that makes it one of the most affordable as well. Seamless Window feature integrates the remote desktop directly into the administrator’s machine for maximum usability and speed. Navigate the remote machine like it was your own. Very affordable: licensing is based on the number of administrators using the software, regardless of the number of servers or clients accessed. Mini Remote Control’s Mirror Driver increases speed and performance of the remote administration session. MRC provides a variety of security options including Smart Card Login. MRC provides extensive security and encryption capabilities, including multiple authentication methods primarily designed to use the operating system's built-in security. It also offers additional options of encrypting all communications between the remote and local machines, taking advantage of today's standards for encryption, hashing, and key exchange. Interactive Smart Card Login and Remote Smart Card Authentication using a Smart Card and PIN from your local machine. No Smart Card middleware is required, and no Smart Card reader needs to be installed on the remote machine. MRC is the only known third-part remote administration tool with this capability. See the entire remote desktop with True Multi Monitor support . Supports more than two active connections on Server 2000/2003: Windows Server 2000/2003 only allows two active sessions. MRC allows users to work around this limitation by sharing a single session, enabling additional concurrent connections with the server. U3 mode allows you to run Mini Remote Control from a device other than your local hard drive. Ability to connect via Mini Remote style connection or RDP (Remote Desktop Protocol) style connection. DameWare Mini Remote Control is licensed per user, not per computer, with no additional fees for client agents installed by the program. The number of licenses required must correspond with the actual number of people that use the software. For example, if there are 10 technicians that will be running the software and connecting to 10,000 remote machines, a 10-user license is required. Each user license allows for three separate installations (for example: desktop, laptop, and home computer). A user installing in three separate locations will still be covered under the license provided that they are the only person running the software on those additional machines. Take Windows administration to the next level. Manage it all right from your desk – around the office or around the world. DameWare NT Utilities (DNTU) provides an integrated collection of Microsoft Windows administration utilities within a centralized interface for remote management of Windows servers, workstations, desktops, and laptops. An intuitive, Explorer-type interface delivers streamlined access to customized versions of Windows administration utilities, many that DameWare has greatly enhanced to provide superior performance, added functionality, and ease of use. DameWare NT Utilities supports legacy (non-AD) Microsoft Windows Network implementation via a dynamic "Microsoft Windows Network" browser tree view. Domain controllers, servers and workstations, as well as non-browseable machines (machines that by default are not shown in Microsoft's Windows Network Browser) can easily be managed via machine name or IP address after being added to the network browser tree view. NT Utilities contains all the tools you need for remote Windows administration. Mini Remote Control Mini Remote Control gives you integrated remote administration from within NT Utilities. DameWare NT Utilities (DNTU) also includes the DameWare Mini Remote Control program for fast and easy deployment and troubleshooting. Mini Remote Control’s powerful feature set and light footprint makes it a favorite remote administration tool among IT pros. Just click to connect, and features including screen sharing, full multiple monitor support, and NAT pass through are instantly available. Easily export information from remote Windows 7/2008/Vista/2003/XP/2000/NT machines, including information about computers, disk drives, groups, printers, members, services, shares, software, users, and information via WMI (Windows Managements Instrumentation) classes. Save the files in common formats including XML and CSV. DameWare NT Utilities’ makes it simple to export and save information about remote computers. Active Directory NT Utilities includes powerful Active Directory management functionality. NT Utilities includes a powerful Active Directory Object Browser and extensive Active Directory functionality for retrieving, searching, and filtering of all AD Objects & attributes. DNTU supports management of objects such as OUs (Organizational Units), Containers, Users, Groups, Contacts, Computers, & Shares, as well as attributes that are not available within native Microsoft tools (i.e. Photos, Logos, employee ID, etc.). This includes support for managing objects such as organizational units, photos, badges, and more, making NT Utilities an end-to-end AD management tool. DameWare NT Utilities is licensed per user, not per computer, with no additional fees for client agents installed by the program. The number of licenses required must correspond with the actual number of people that use the software. For example, if there are 10 technicians that will be running the software and connecting to 10,000 remote machines, a 10-user license is required.